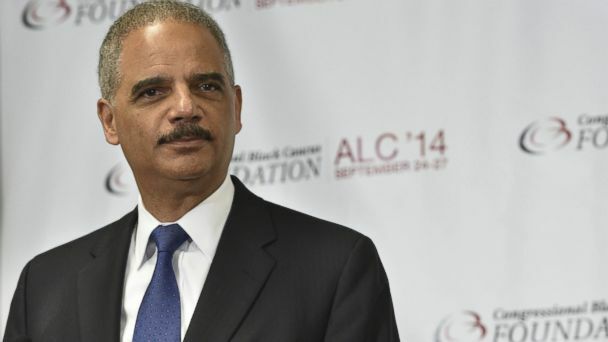 A day after announcing he would leave the Obama administration in the coming months, Attorney General Eric Holder said his Justice Department would continue to battle "restrictions that discourage, discriminate, or disenfranchise" voters. "I have no intention of slowing down," he said today at a meeting of the Congressional Black Caucus Foundation's annual legislative conference. "My colleagues and I are acting aggressively to ensure that every American - that every American - can exercise his or her right to participate in the democratic process unencumbered by unnecessary restrictions that discourage, that discriminate or that disenfranchise in the name of a problem that doesn't exist," he said. Holder has used the Justice Department's Civil Rights Division to aggressively enforce the 1965 Voting Rights Act, seeking out what the Obama administration perceives as attempts at congressional redistricting to under-represent minority communities or voter suppression. But the practice has been a lightning rod for Republicans who claim Holder uses the office as a political weapon to inflate Democratic impact in elections. The enforcement has also extended to the administration's refusal to uphold the Defense of Marriage Act , enraging religious conservatives. His fight has had ups and downs this month. On Wednesday, an Ohio appeals court upheld an extension to early voting after civil rights groups, backed by the Justice Department, claimed its removal would be a burden on low-income communities who needed the time to organize voters. But two weeks before that, a Wisconsin voter ID law assailed by liberal groups was upheld, and seen as a victory for Republican Gov. Scott Walker. Holder will not leave office until a successor is confirmed by the Senate, but he has previously suggested he would continue to remain active in the civil rights community as a private individual. His horizon would include changing the federal voting status for residents of the nation's capital. "Six hundred thousand taxpayers who, like me, live in the District of Columbia and still have no voting representation in Congress. We pay our taxes, we die in the Army, we have a great representative and we do not have voting rights," he said today. For the immediate future, the attorney general announced one new move coming out of the Justice Department. The "Smart on Juvenile Justice initiative" will partner with Georgia, Hawaii and Kentucky, and the Pew Charitable Trust to develop reforms and grants aimed at reducing habitual crime and racial disparity in the juvenile justice system.